Conquer any kind of obstacle with fun and flexible LEGO® City Tracks! Grab your stethoscope and head to the LEGO® City Hospital, where heroes are needed every day! 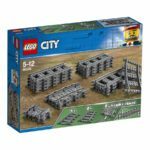 Grow your LEGO® City population with this fun People Pack – Outdoor Adventures set, featuring a wide range of minifigures and endless possibilities for activities, including a dinghy, tent, mountain wall and a log pile with ramp. 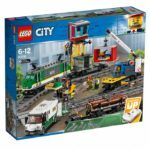 Load up the powerful LEGO® City Cargo Train and deliver the goods on time! 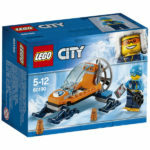 Discover incredible things with the LEGO® City Arctic Ice Glider set, featuring an ice glider with opening cockpit and spinning fan rotor, plus 2 remote tracker beacons, a decorated computer pad, radio, saw and a pair of snowshoes. 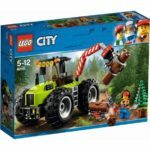 If you have a forest in your LEGO City Collection you’ll need this LEGO City Forest Tractor. 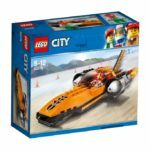 Take the wheel and wait for the green light with the powerful LEGO® City Speed Record Car! This fast rocket car toy for 5-12 year old boys and girls features an opening cockpit, iconic flame elements and a large rear wing. 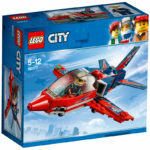 Get ready to put on an amazing show with the LEGO® City 60177 Airshow Jet, featuring an opening cockpit, awesome decorations and landing gear. Pick up your badge and help stop the LEGO® City Wild River Escape! 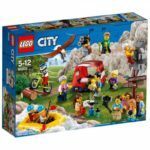 Deliver justice with a Mountain Arrest, featuring a 2-level hideout with bathtub, police helicopter with net shooter, winch and string, crooks’ vehicle, 4 minifigures and a bear figure.